Nehal Tailor of Wellington was studying INFO402- ‘Current Issues in Information Systems Research’ at Victoria University in 2017. Nehal gained an A+ on a research report that she submitted titled Improving Patient Healthcare – An examination in an Epidermolysis Bullosa Context. Nehal examined how online communities can give opportunities to interact and communicate within the community of like- minded individuals who aim to improve EB patient healthcare. As a young woman with EB she has been able to use her personal experience to give insight into the valuable role that online communities can play. Epidermolysis Bullosa (EB) is a rare, painful genetic disorder that lls every aspect of the carrier’s life. Given the severity of the condition, many EB patients struggle to receive social support from their physical communities; however, online communities give these patients an opportunity to interact and communicate within a community of like-minded individuals who aim to improve EB patient healthcare. Examination of the Epidermolysis Bullosa Online Community highlighted that the platform could be leveraged to create a powerful virtual support community through knowledge and experience sharing, but not be a means for EB specialists to conduct virtual consultations due to the specialist knowledge and physical touch required to treat EB. Instead, EB specialists and experts should leverage the platform to disseminate information. 23 MAY 2017: The day I crashed and my world got a whole lot smaller – for a while at least. 1 3⁄4 hours into one of my typical training rides (mountain biking) a small error had me careering off track and into a tree. Actually, it was my bike that hit the tree, I was catapulted off and over my bike, landing on the ground with enough force and energy to break my hip (subcapital neck of femur). It took 2 hours for emergency services to get to me (yay for Westpac Rescue) and immediate surgery to put Humpty Dumpty here together again. Amazingly, and probably due to the fact that I had all my cycling gear on and I landed directly on my hip with no sliding action or superman arms I still had pretty much 100% skin coverage – no blisters or skin off.The surgeon was extra extra careful with my skin in surgery and did a good job of not causing any damage. I did have mouth ulcers post surgery and blisters formed on the backs of my heels from inability to move about easily in bed for the 10 days that I was in hospital. The crutches caused some blisters too until I taped padding on them. Back home it was the start of a long hard road to recovery, unable to fully weight-bear for 4+ months. I want to thank DEBRA NZ for helping with the purchase of a topper pad and extra pillows for my bed when I had to stay lying down for weeks. That made a huge difference to my ability to get comfortable and sleep better! Because I was fairly active prior to my injury they didn’t do a full hip replacement, rather, inserted a compression plate and screws (Dynamic Hip Screw) and a few extra ‘nails’ to stop the femur from rotating. Meanwhile, I still have 3 active children aged 8, 11 and 13 to look after (who also lucked out in the gene pool and all 3 have EB). Alexander (8) had very thoughtfully had his stint in Starship Hospital out of the way 3 weeks prior (lymphadenitis – a complication from an infection and he needed iv antibiotics to get on top of it) so it was just the usual run-of-the-mill care to contend with. Oh, except that one time when Alexander insisted on hurtling himself down the driveway on his drift trike, going for the world record in removing as much skin as possible when he tipped over. I had to call for reinforcements on that one. I couldn’t get into a position to even begin to start cleaning him up. Life was extremely frustrating for me, I couldn’t attend the children’s school events, I wasn’t used to not being active, I couldn’t even make the kids beds! 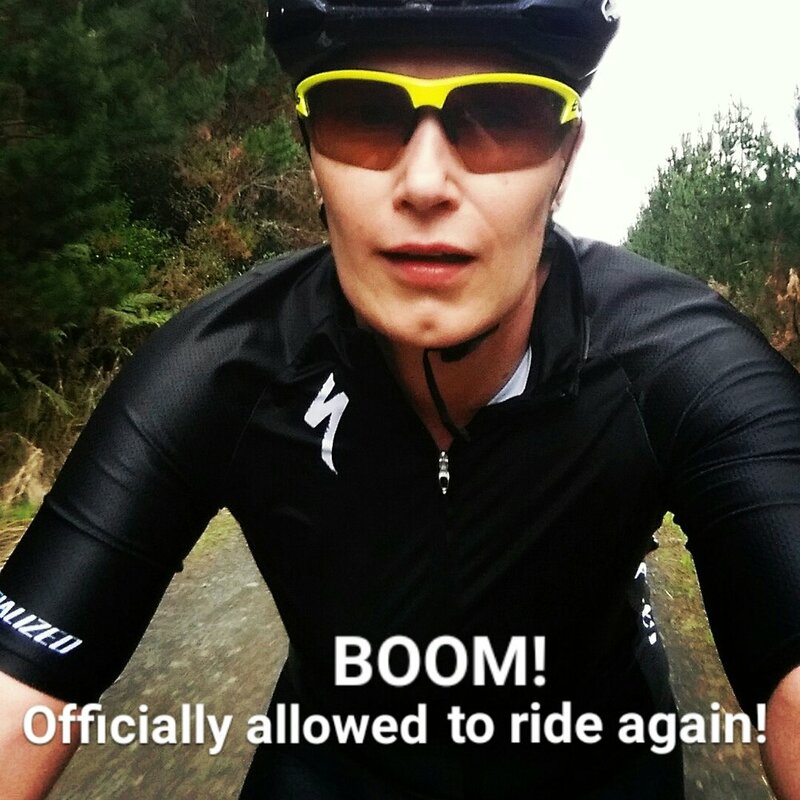 When my surgeon finally gave me the okay to get back on my mountain bike 5 months after my crash, little did he know that it was already in the car waiting, in anticipation for those words (actually he probably guessed there wasn’t any stopping me, I was desperate to get back). Getting back on my bike however, turned out even more frustrating than not riding at all given all the damage. In all honesty, it has taken me a further 6 months to see real improvement in my strength, confidence and a HUGE amount of stubborn determination not to give up. Don’t think those days didn’t exist, they did, and there have been many of them. Finally, last month, and I think to my surgeons relief, the latest round of x-rays confirmed the fracture has healed, there was no evidence of AVN (the bone dying from disruption to the blood supply), the metal-ware has done its job, and so I’m having it removed. Partly because it causes discomfort, but also because I insist on continuing to ride, leaving it in introduces the risk of further fracture should I fall again. WHEN I fall. What can I say, it’s an inherently dangerous sport, it’s a given I will come off every now and then. Lessons? I believe that a lot of our limitations are our own doing. Yes, you have to be realistic and manage expectations, but you’ve got to do what you love, what drives you. Here I am, back doing what I love. EB didn’t stop me, and nor did the medical experts who I’m sure raised a few eyebrows. Yes, I leave skin out there, but I manage it. I encourage my children to have the same attitude. OK, I’ll admit that Ripper Rugby and Soccer didn’t play out so well for Alexander – that was a bit of a hot mess to be honest. BUT, we tried it, because he wanted to. Victoria (now 12) is playing intermediate A-grade hockey and has U13 Representative trials coming up (I can’t watch when they play on sand turf. I leave the first aid supplies with the coach for those), and Ashley is back into the Volleyball Development Squad next Term. And me, I’m completing my National Certificate in Outdoor Recreation – Mountain Bike Leadership. Of course!